Try to play in a new and interesting kind of basketball. 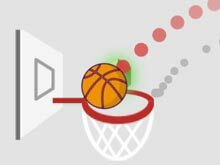 Your ball is already in the basket, which is also a kind of catapult and with it you have to send the ball into the other basket above. How long you can play without a miss? Good luck! To find this game for next time, use these keywords in games search: “Dunk Shot”, “Basketball Games”. Play free online games without limitations! We have compiled the best games for boys.